Willemstad – CHATA’s new year’s event was an explosion of color, art, tasty food and positive vibes. With the artwork of local artist Francis Sling as backdrop, live painting sessions by Serena’s Art Factory, local art vendors and tasty bites prepared by the Curaçao Culinary Team, CHATA wanted to emphasize the importance of our local heritage, art, culture and people to further grow and develop the tourism sector. “Just as today’s celebration is a collaboration of many local and international talents, so we must continue to combine our unique talents and resources to further grow our industry” according to Miles Mercera. CHATA kicked of the new year together with industry professionals, government officials and key stakeholders in a new year’s event that took place on February 7 at Keizershof. During the event, CHATA presented its vision and goals for 2019. Furthermore, CHATA also took the opportunity to launch its new in room magazine and recognize Mr. Hugo Clarinda for his great contribution to the Tourism Industry. Miles Mercera, President & CEO of CHATA addresses the membership in his opening speech where he spoke about the immense potential of the destination that can only be unlocked by the coming together of its people. Miles Mercera argues that Curaçao has only tapped about 30% of its true potential. “Imagine if we combined our talents and resources to tap into an additional 5% of our potential and reach an additional 40K visitors, the spin-off would be immense, namely an additional influx of 100 million USD in our economy. Miles continues by stating that Curaçao has a lot of room for growth to further develop the industry, we still have massive amounts of unique property available for development, room for growth in air service, available room inventory, a transportation industry with great potential to be brought to the next level, and the ability to create many new jobs for our local community. This however can only be achieved if Curaçao prioritizes the industry in all decisions that it takes on a daily basis. CHATA launched its in room magazine, “InCuracao” that is exclusively available in all CHATA member accommodations. The magazine produced by CHATA Member, Fortress Interactive, holds a compilation of unique experiences for different travel types ranging from cultural explorers, foodies and adventure seekers. 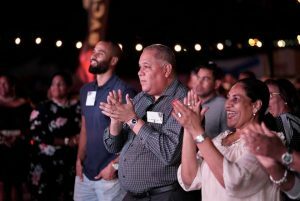 CHATA also celebrated one of our industry professionals who has devoted himself with fervor to the growth of our Tourism Industry; Mr. Hugo Clarinda the Deputy Director of the Curaçao Tourism Board. This year Hugo celebrates 16 years within the tourism sector. Hugo started his journey at the Curaçao Tourist Board on September 22, 2003 as Sr. Management Assistant. From there he has worked his way up to Interim Director. A position he held for 5 years. CHATA and its members are extremely grateful for the tremendous contribution Hugo has made to the development of the tourism industry in the past years. From the great strides in tourism arrivals the industry has achieved under his leadership to the increase in airlift from different target markets. On behalf of the entire sector CHATA thanked Hugo for his hard work and is excited to continue working with Hugo in his new role at CTB. CHATA looks back at a successful event and is hopeful for the future and encourages the community to come and stay together to make 2019 our best year yet.